This is a new section of my web site. Please excuse it's rough form. Racently I was turned on to a new concept that gives me real need for a portable GPS logger. Although the possibilities for staging a race based on accuired GPS data has been possible since the first portable loggers became widely available, MotionBased Technologies, has mixed in internet capabilties to make a true grassroots racing phenomina. Now, any person riding a section of trail or road can log and post a time that others can compare. GPS Visualizer is a free web based program that will output .SVG files that you can edit on Adobe Illustrator. Google Earth is a new up and commer. Check it out. A note about hardware: Basic GPS Units will not work very well for accurate tracks and times while mountain biking. You will need something with WAAS signal support and a high sensitivity reciever processor similar to SiRFstarIII. A good example of such a unit is the new Garmin Edge 205 and 305 (Jan. 2006 release). Be very carefull not to buy the wrong unit. I had tried to use a Garmin Rino 130 and it was basically useless on the trails. In the next few weeks, as I play with my new toy, I will post some 3D maps of local roads and trails that I will be riding on my motorcycle or bicycle. AutoCAD and Illustrator actually work very well for producing these maps. Here is an example of a recent motorcycle ride in norther Sonoma County. I was running out of gas on the return trip, so i had to stop and have someone follow me out. I'd hate to have to walk my bike out. The real key to GPSracing is that the times and routes can be validated with data files similar to .xls or mapsource files. The Skaggs run (above) is saved in THIS file. The system is not foolproof. A cheater can still easily cheat, but with a little honesty and respect, a lot of good fun can be had. Producing a nice little graphic, like above, is very easy. Save the cleaned Track file as a .DXF file. Open the .DXF file in Adobe Illustrator (or AutoCAD). Get the look good, add a little text, and save as a .GIF. 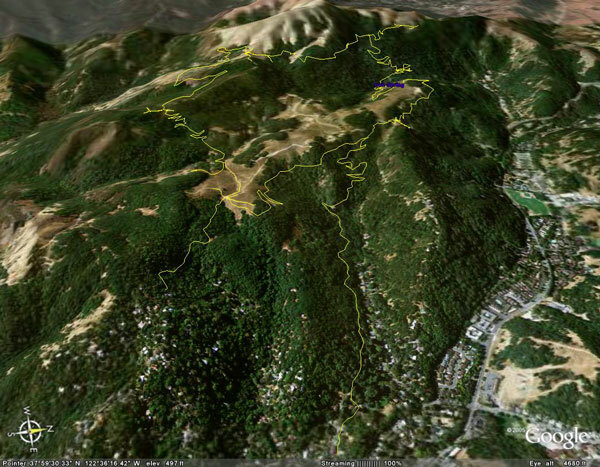 In very small areas where elevation is reasonably within the same scale as the area, a 3D graphic of the route can be made. This would be nice on large BMX tracks, bicycle dual slalom courses, and auto racetracks. 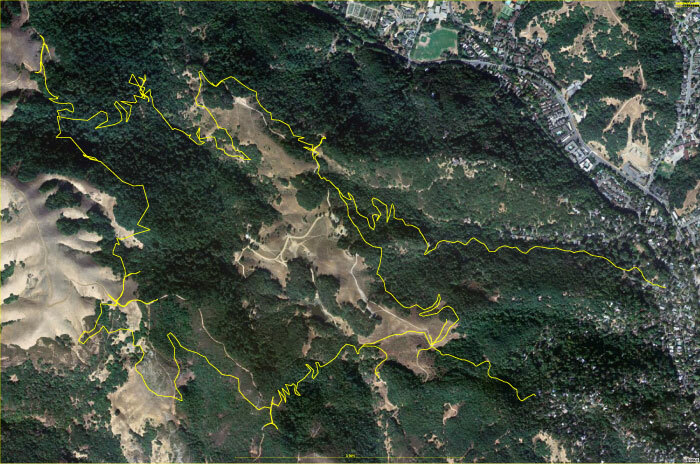 One little side project that I have been working on is a map of a local mountain biking area, Camp Tamarancho in Fairfax.